Tucked away in the northern corner of Spain, sharing a 163 km stretch of border with France and a western border with the Basque Country, Navarra is one of Spain’s undiscovered autonomous communities. Literally and metaphorically, this is Green Spain – as this area leads Europe with its use of renewable energy technology – mainly from wind farms and solar energy, although Navarra has the most complete gas distribution system in Spain along with biomass and water energy centres. Geographically Navarra is generally divided into three distinct regions, from the north to the south – the mountains, the central Zone and the Ribera, on the banks of the Ebro. The Western Pyrenees make a natural frontier with France in the north, sloping down from the east to the west, and the Ebro crosses the south of the region, providing an extensive canal system. 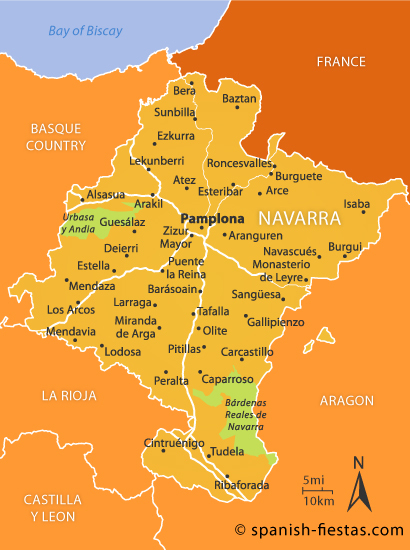 Before the Romans established themselves in Spain, Navarra was inhabited by a tribe known as the Vascones, who managed to keep hold of their independence, language and traditions during Roman, Visigoth and Moorish times. The actual Kingdom of Navarra was fully established in 824 and, at one time, included parts of La Rioja, the Basque country, Cantabria, Aragón and Castilla y León within its boundaries. The majority of the area was absorbed into Spain in 1512, although a small part of the territory was claimed by France. Even at this time, though, the area was given some degree of autonomy, which it kept even during the very centralised rule of General Franco. Linguistically both Spanish and Basque are spoken in the region, although it is in the north west of the area that the majority of Basque speakers can be found. The southern areas are almost entirely Spanish speaking whereas the region’s capital, Pamplona, is officially ‘mixed’. Economically the main industrial centres can be found in and around Pamplona and most agricultural activity is in the Ebro valley, with wheat, vegetables, olive trees and wine being the major products grown. Also there is still a good deal of dairy farming. As is always the case in rural Spain, tourism has an important economic role. With the influence of the Pyrenees in the north and the Ebro valley in the south, there are clearly significant differences in climate between different parts of Navarra. The average rainfall in the north is high, spread throughout the year, and there can also be snow here. The summers are known to be rather humid. Further south, the climate is more Mediterranean in nature, with higher temperatures and much less rainfall. Navarra has one airport, at Noáin, just south of Pamplona but this only deals with internal flights to and from Madrid. Alternatively, you could fly to Bilbao, Zaragoza, Madrid or Barcelona then travel here overland by bus or train. Another option is to fly to the French airports of Biarritz or Pau which provide relatively easy access to the region. There are excellent rail links with both Madrid Atocha (4½ hours) and Barcelona Sants (6 hours) and the network connects with the French rail system to the north. Check the RENFE website for up to date timetables. Visitors from the UK can take a ferry to Santander or Bilbao from Portsmouth or Plymouth then travel to Navarra by public transport or in your own car. Road access from all directions is excellent. There are many bus services to Pamplona from Bilbao (1¾ hours), San Sebastian (1 hour), Barcelona (5 hours) and Madrid (5 hours) but as a rule you’ll find the train service to be a superior option. The most popular destination in the region, of course, is Pamplona, famed throughout the world for its famous, or infamous depending on your point of view, running of the bulls. Even when the festival of San Fermín is not in full swing, though, Pamplona is a city worth visiting. It has a wonderful 14th century cathedral, with the tombs of Carlos III and Queen Leonor, and numerous other impressive buildings within the old city walls. 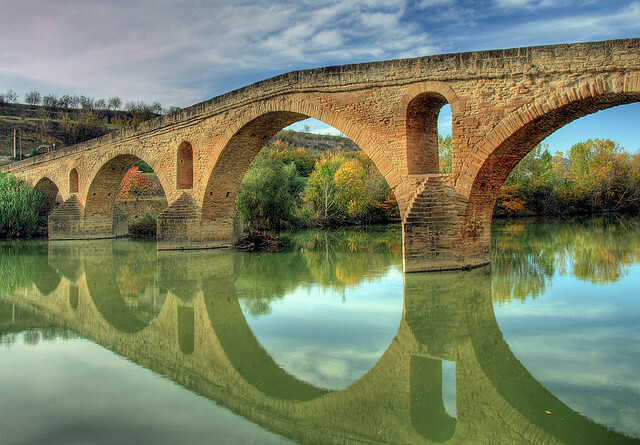 There are, in addition, some quite beautiful smaller towns – such as Artajona, surrounded by medieval walls; Olite, once home of the kings of Navarra and now the wine-making capital of the area; Puente La Reina, named after the six-arched medieval bridge crossing the River Arga and home to the highly impressive Gothic crucifix brought by the Knights Templar on the Camino de Santiago; and the picturesque towns of Estella, Roncesvalles and Tudela. All of these typically Spanish places make fine places to visit in their own right but can also serve as excellent bases to explore the varied countryside Navarra has to offer travellers. There are many picture postcard villages in the mountains, completely off the tourist trail, and some wonderful walking territory. For example, try and visit the Irati forest, the second largest fir and beech forest in Europe, close to the villages of Urbaitzeta and Ochagavía, where Hemingway used to go fly fishing when he wasn’t chasing bulls in Pamplona. Arguably the most scenic little town, proudly situated on a hill and visible for miles for travellers on the Camino, is the medieval town of Cirauqui, with its winding streets, well-preserved stone houses and Roman roads. And all of this is without mentioning the endless possibilities of the Pyrenees, with some wonderful walking and climbing activities and, although the skiing here is not as notable as in other parts of the mountain range, there is a good base for skiers at Isaba. The Festival of San Fermín in Pamplona takes place in the second week of July. If you’re going, be advised that the hotels are booked up well in advance and many locals take advantage of their visitors by renting out their houses or apartments for somewhat exorbitant rates so that they can subsidise their own holidays and get away from the crowds for that week. Having said that, though, it is one of those events many people will want to see at least once in their lifetime and the whole thing, from the initial procession on July 7th to the final party at midnight a week later, lives up to everything that Hemingway, Michael Palin and just about everybody else ever wrote about it. Warning: If you are tempted to ‘run the bulls’ I can only recommend that you don’t take too much ‘Dutch courage’ before you begin and also that you try to find an experienced local to run alongside. Be aware though that this isn’t a theme park ride – it’s for real – and every year there are serious casualties, sometimes fatalities. A much less noisy fiesta – in fact, traditionally totally silent – is the Javierada, held in March at the castle at Javier to celebrate the birth of the region’s patron saint, Francisco de Javier. Perhaps the most visually stunning of the many Easter festivities in the area is the Bajada del Ángel – the Descent of the Angel – in Tuleda; a ceremony in which a child is perilously lowered through the air to remove a veil that has been covering the face of the virgin. The children all gather afterwards under the clock tower where balloons and sweets are showered down upon them. Navarran cuisine is well-known for its asparagus, mushrooms and artichokes and other fresh vegetables, especially the pimientos del piquillo – peppers often stuffed with game or fish. Amongst the specialty dishes is calderetes, a lamb and potato stew. There’s a good range of chorizo and sausage as well. The local dessert cuajada, made from sheep’s milk and honey, can often be found on dessert menus throughout the rest of Spain as well as Navarra. There are five wine-producing areas in the region, especially noted for some good quality Tempranillo reds and some well-respected rosé wines. At the end of a meal, try and find a home-produced Pacharán, a local liqueur of aniseed and sloe berries, now often commercially made. Have you been to Navarra? Have you ever visited any of the places I’ve mentioned in this article or attended any of the region’s festivals? How about its wines or hearty dishes, have you tried them? Any anecdotes or travel advice are always welcome by our readers in the comments box below. I just wanted to reach out and extend a huge, gracias for all the thorough work that you have been doing here! I registered to your website in early 2009 when I was about to travel to Spain, to the Basque country on a scholarship for three years! Your content whets my curiosity about this beautiful country, a journey that will be lifelong I am certain. I have seen this website evolve since 2009, and the content really has improved, in depth and volume. It is a great catalog of regional and local information for English-speakers, and I only wish that this endeavor continues to grow. All the best! Thanks Janvi … you will never know just how much I appreciate your wonderful comments. Very interesting article, as always! I visited Pamplona about 10 years ago and had some delicious tapas made from something that looked like small worms and tasted of fish, apparently a local speciality. Do you know what that would be? You may well be referring to ‘Angulas’ which are baby eels. I thoroughly enjoyed reading your article about Navarra. My desire to visit that region of Spain is renewed, especially all of the communities that you mentioned. As a city planner, I enjoy exploring cities rich in history and culture. I’m told that my ancestors originated from Spain, so I have an inherent and genuine interest to travel to Spain. I will make it happen. 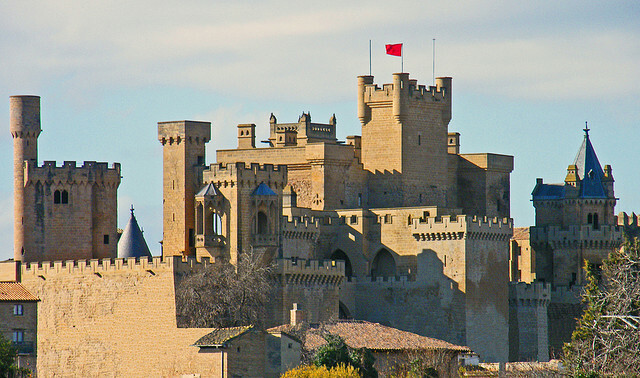 Judging by the pictures The Kingdom of Navarra looks a fairy tale place!! I wish to thank Gerry once more for taking us to so many amazing places! My husband and I LOVE driving through northern Spain, and usually begin or end in Barcelona so we know Navarra. I encourage everyone to visit especially in the northern part in the Pyrenees at the border with France. The region is gorgeous and untouched, and many important events have unfolded there through a long course of time, so while one feels totally in the moment because of the spectacular vistas, due to the history, there is a deep sensation of being connected to the past. Its almost eerie it is such a spectacular place! Northern Spain is where Europe began so one cannot help but feel these very early roots. I am a writer and am currently finishing a book about northern Spain. (It will be my third book & will be published in 2016.) Naturally, food plays a big part in what I am writing since everyone in northern Spain is a major gastronome. I want to tell everyone about a ‘Truck Stop’ HGWY restaurant outside of Pamplona that is very special – This deceivingly simple highway rest stop offers truly remarkable paella! It is served in a huge pan and the older Basque ladies who cooked it are dress in black. Though they seem somber it is because they deeply care that their paella must be THE best. To us, it was. Don’t miss this place. It has great atmosphere, too. The stone building was designed by a wonderful architect – there is plenty of light and while one eats their paella, one looks out through the soaring wall of solid glass to view The Pyrenees. Thanks Robin for this great recommendation of this very special region. I’ll certainly look out for that truck stop. Having read your post could you please tell me where exactly where we will find this truckstop serving the paella. You say it is outside Pamplona but that is very vague. I have tried to find it on the internet but not managed to so please can you help. We are off to Northern Spain in early September & would love to stop there and try it. We like to find & try things off the beaten track & this is just a little bit different. Thanks. We love visiting Spain and very much enjoy reading your Spanish Fiestas newsletters. You highlight some great historical, cultural, and culinary things that are no readily available in most other travel literature. Can’t wait to return to Spain to see more of this fabulous country.